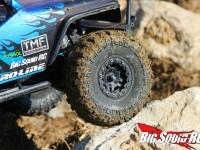 pro-line faultline wheels « Big Squid RC – RC Car and Truck News, Reviews, Videos, and More! You are browsing the "pro-line faultline wheels" tag archive. I’ve had my Pro-Line Faultline 1.9 wheels on my main Axial SCX10 comp/trail truck for close to five months now and in that time have beaten the tar outta them. Click the “Read More” below to see how they fared!